Monroe is ISO 9001:2015 & AS9100D quality certified and specializes in the manufacturing of piano hinges (also known as continuous hinges). We provide aluminum piano hinges, steel piano hinges, stainless steel piano hinges and other materials. 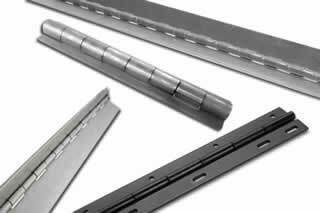 We carry a wide variety of piano hinges in all open widths, leaf thicknesses, and lengths. Monroe can manufacture piano hinges to your exact specifications and are equipped to produce special and fabricated hinges. We can perform operations including: punching, forming, offsetting, notching, countersinking, finishing and plating. Holes can be added depending on quantity requested. Are you looking for Piano Hinges?